Japanese Episode AG 136: "The First Battle! The Battle Factory! (Part One)"
American Episode 406: "Numero Uno Articuno"
As Satoshi and his friends wander around, looking for the Battle Factory, they spot a marvelous sight - the legendary pokemon, Freezer! The pokemon is seen flying beside an airplane before disappearing, causing our heroes to speculate about the reason it's in the area. The trainers spend the night at a nearby Pokemon Center and prepare to resume their journey when Enishida appears! After introducing himself to Satoshi's friends, Enishida guides our heroes to the Battle Factory. There, a giant tank-like machine has gone loose! Satoshi and the others use their pokemon to stop the vehicle and earn the gratitude of the tank's driver, Factory Head Datsura! Datsura is the Frontier Brain of the Battle Factory and accepts Satoshi's challenge to a battle for his Frontier Symbol. 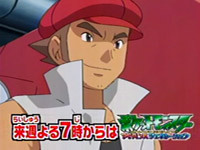 Datsura shows Satoshi his pokemon and tells him to choose his opponent for the match, a choice that Satoshi has a hard time making. As Satoshi weighs the pros and cons of each pokemon, Haruka and Masato stumble into the Battle Factory's hangar, where the legendary pokemon Freezer is resting! Datsura reveals that he earned the pokemon's friendship when he helped it when it was injured and that it will now battle for him. After Satoshi-tachi thwart an attempt by the Rocket-Dan to steal all the pokemon, the young trainer from Masara Town chooses Freezer as his opponent. Datsura asks who Satoshi will be using, and he is answered when Satoshi's Lizardon appears! As the day draws to a close and the participants in Satoshi's battle for his first Frontier Symbol are chosen, the trainers' fighting spirits burn brightly. To be continued! At this point in the Battle Frontier storyline, the anime producers seem to be following the same formula they've always done. After a bunch of filler episodes, we get a setup episode that introduces us to the Gym Leader Frontier Brain before the actual Gym Battle episode. They've been doing that regularly since the Jouto League, did it all throughout the Houen League, and now seem to be doing it through the Battle Frontier. Later we see that the anime will sort of stray from this formula and give us a bunch of Frontier Brains who only get one episode apiece, so Datsura is special in that he gets two episodes. I suppose it's proper since he's the first one he faces and all, but it's still unfortunate that the anime will sort of rocket through the remaining Frontier Brains without a second thought. I mean, plain old Datsura gets two whole episodes while the potentially hilarious Heath only gets one? Lame. Another thing that bothers me is Lizardon's appearance at the end. I mean, we're to believe that it flew from Jouto all the way to Kanto in the space of one afternoon!? I mean, yeah, I'm sure it could do it, but it's still one hell of a journey for a pokemon to make on such short notice. Despite all my griping, I did enjoy this episode. Datsura enabling Satoshi to choose his opponent for the match is a nice change-up from the usual way things are done, and seeing a Frontier Brain with so many pokemon shows that these guys don't just stick to one elemental type the way Gym Leaders do. In Japan, the opening theme and ending theme changes. The opening theme is now Battle Frontier while the ending theme is Pokemon Kazoe Uta (aka "the poor man's Pokemon Ondo"). Freezer keeps its Japanese voice. The first three seconds of the episode are trimmed away. This happens right before Scott arrives at the Battle Factory. Did he go to the same driving school as Professor Birch or what? Scott: "OK, here we are! What's wrong?" Brock: "I'm gonna be sick~"
Scott: "Oh-ho, I know what it is. I think I forgot to put on my deodorant this morning!" Forgot to put on my deodorant! Ha! That's some grade A comedy there, 4Kids. Wow. You should get out of the kids' entertainment industry and start doing stand up. Seriously. Anyway, Enishida originally apologizes for not taking a regular road to the Battle Factory. Later, we get some fourth wall breaking. Jessie: "(Laughs) It's almost too good to be true. This plan will really work!" James: "Careful Jess! We don't want to jinx it!" Meowth: "Let's keep Jynx out of this"
I think it's interesting that they'd reference the whole Jynx controversy in the show with Meowth's line. That was certainly unexpected. A second is trimmed from the shot after the Trainer's Choice commercial break. So there's a scene of Gonbe standing in front of Freezer, and I've noticed some confusion fans have about the scene. They've seen a picture of Gonbe being frozen by ice and assume that this is the episode that it was taken from. Y'know, assuming that Freezer is the one who encased Haruka's pokemon in ice. So when they don't see the fourth generation pokemon encased in ice, many assumed that something was cut out of this episode. Well, that's not the case at all. 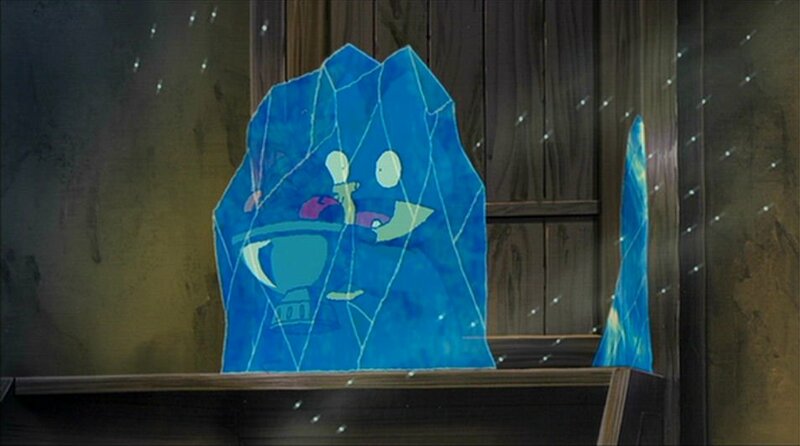 That shot of Gonbe being frozen is actually from the third AG movie, Myuu and the Wave-Guiding Hero, Lucario. Not this episode. Nothing was cut out of the Gonbe scene in this episode, so all you Gonbe haters out there have nothing to worry about. You'll see that fourth generation marketing tool frozen solid soon enough. This happens as Max is admiring Noland's Articuno. Max: "That's the strongest pokemon you can catch!" Originally, Masato didn't make such an incorrect statement. He originally said that it's cool that Datsura caught a Freezer, followed by Datsura's explanation that he didn't exactly catch it. None of this "Freezer is the strongest pokemon ever" crap. From the end of the flashback to Datsura's meeting with Freezer until the Rocket-Dan show up, The Challenger!! is heard playing in the background of the Japanese version. This is replaced by instrumental music in the dub. Three seconds are trimmed from the shot after the final commercial break.